When I came into the world, I was in Perth, Western Australia. 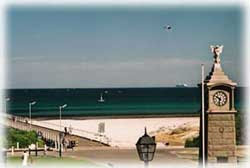 Whilst we lived in various locations in the suburbs, we had relatively easy accessibility to the great beaches of Perth. The coastline of Western Australia faces the Indian Ocean, so the beaches are fabulous there - big waves, beautiful sandy beaches, the occasional stinging jellyfish. Perfect! And then, when I was about 10, my mother decided to leave Perth, and we moved to Adelaide. Adelaide is situated on a gulf so there is no direct ocean frontage. The beaches are really sandy (most of them anyone), very few stinging jellyfish, but not very much in terms of waves either. We lived about half an hour away from the beach, and I used to spend quite a bit of time down there in the summer just hanging with my friends, and also during winter for brisk walks along the sand. I lived in the UK for five years, and during that time I went to the beach twice - once to Blackpool and once to Brighton (very rocky beach) and when I left there I returned to Adelaide for just under two years. Now I live in Melbourne, and have done so for nearly 7 years. Melbourne is in a bay so again there are no huge waves in the suburban areas. I do like to kid with those die-hard Melburnians that the beaches here are all really horrible, but that is an exaggeration, because there are some sandy stretches of beach and on the other side of the bay there are some lovely beaches (an hour and a half drive is a long way to get to one of those nice beaches though). There are also lots of stretches of really rocky areas. I moved to my current location about 2 and a half years ago, and today, for the first time, I went to my local beach. I had avoided it before now because I had heard that it wasn't very nice, and on the few occasions I had driven along the beach road, it appeared to be all pretty rocky. It was however so hot here today, as it has been for the best part of a week, that my son and I decided to go for a drive and take a closer look. Turns out it isn't so bad. No waves, quite a few jellyfish but I have no idea if they sting or not, and quite a coarse gritty sandy stretch with lots of pieces of shells and small rocks in the sand, but beach nonetheless. We'll be going back again for sure. I might even go down there at some stage during winter and contemplate life with the wind blowing through my hair and me all rugged up sitting listening to the sounds of the water. Well, they are much prettier than the beaches that we have here...which would be 0! :-) Loved the pictures!